100 beers. Under one roof. Go. They say a community that plays together, stays together. Yes. 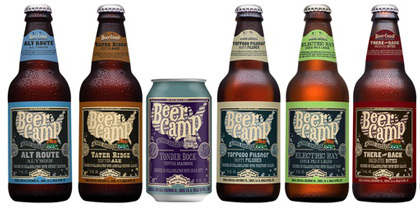 Introducing Beer Camp Across America, Sierra Nevada’s epic traveling beer festival, stopping in Chicago Sunday, July 27th, tickets on sale now. First, the plays together part: Sierra Nevada hooked up with 12 different breweries to collaborate on a one-time only sampler pack. 12 distinct brews, featuring collaborations with editor faves Three Floyds, Cigar City and Russian River. Those boxes are currently rolling out nationwide, and you’ll be able to purchase soon (get pumped with this video). We suggest you head out and check your local joint. The stays together part: They’re bringing the 12 collaboration brews across the country and inviting tons of regional breweries to come pour alongside ‘em. So consider Beer Camp one part festival, one part ultimate beer release party, one part celebration of our city’s favorite beverage. A ticket gives you “unlimited tasting where possible,” whatever that means. Point is you’ll have access to suds from more than 100 of your favorite breweries, Chicago accounting for at least 17 of them. We’ll be sure to try each and every one.